Beets are in season! If beets are planted from seed at the same time, they are all harvested at once. Staggering your plantings can keep you in fresh whole beets throughout the season. However, this does require a bit more due diligence. 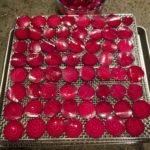 If you take the easy road, like me, having a number of different ways to prepare and preserve your beets at harvest will keep you enjoying beets throughout the year. 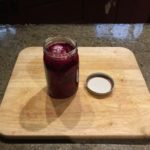 I am providing two quick and easy beet recipes, a dried beet chips recipe and a refrigerator pickled beets recipe. Roasting beets and freezing them is another great way to preserve this early season vegetable. Using your beets to make Pennsylvania Dutch Pickled Red Beet Eggs or Amish Red Beet Eggs is another option. Beets are an amazing root vegetable. They are very versatile and the flavor is unique. There are also many benefits of beets. The health benefits of beets include all sorts of vitamins, minerals, and fiber. Whether you are making roasted beets, pickled beets, beet greens, beet juice, or beet chips, they are a great addition to anyone’s diet and menu. Dried beet chips are a healthy snack and very easy to make. Prepare beets by removing the tops, slicing only a small portion from the top so it is flat. Also, remove the root by slicing it off flush with the bottom of the beet. Using a mandolin, slice the beets. Thickness is more of a preference. I chose the most thin option on the mandolin. The next thicker size would also make a good beet chip. 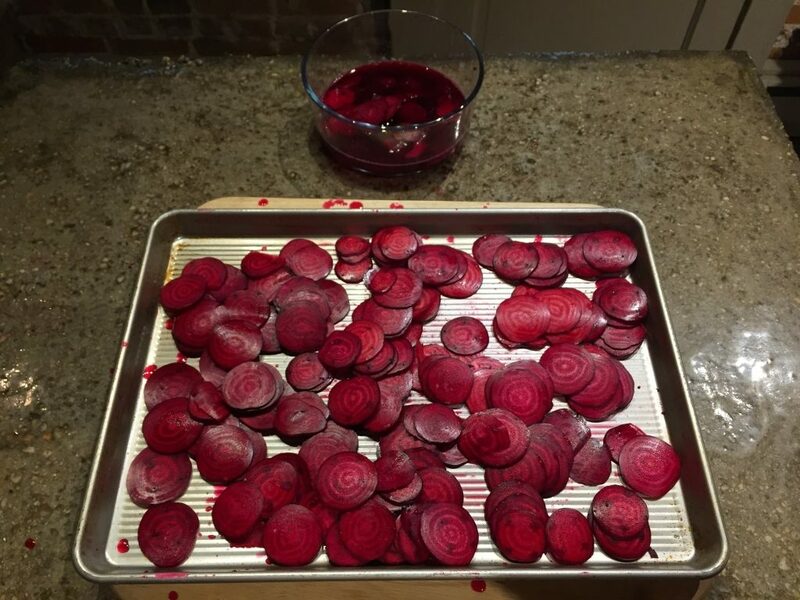 Soak the beet slices in vinegar prior to dehydrating. This is an optional step. I enjoy the added flavor vinegar brings to the beet chips. Place the slices on a dehydrator tray. Dehydrate at 120 degrees for 18-24 hours. As far as healthy chips are concerned, dried beet chips rank near the top! Beets can be traditionally canned and pickled. However, this is a quick refrigerator pickling recipe for beets. 1 tbsp Spices (Optional) 1 Bay leaf is an option, pickling spice is an option. 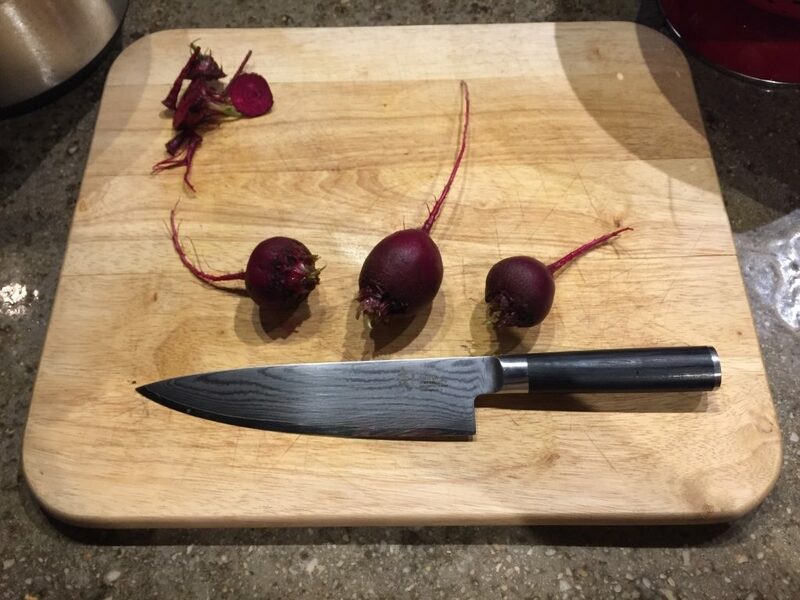 Prepare beets for slicing by removing the tops and the root. Slice the beets thin with a mandolin. Prepare the pickling brine. Add Vinegar, Water, Sugar, Salt, and optional spices to a sauce pot. Simmer until sugar is dissolved. Add the sliced beets to a 1 quart mason jar. Pour the brine over the beets. Allow the beets to cool. Seal the jar and place the beets in the refrigerator for about 1 week. The beets need ample time to soak up the pickle flavor. I like to initially and throughout the week, shake the jar to be sure the beets aren't sticking together. This recipe could also be made without the sugar. Growing beets is one of the easiest garden vegetables. They grow with very little effort and they are one of the first vegetables ready to harvest in the growing season. You can also buy fresh whole beets at a local farm market or the grocery store. Harvesting beets from the garden is a dirty job. 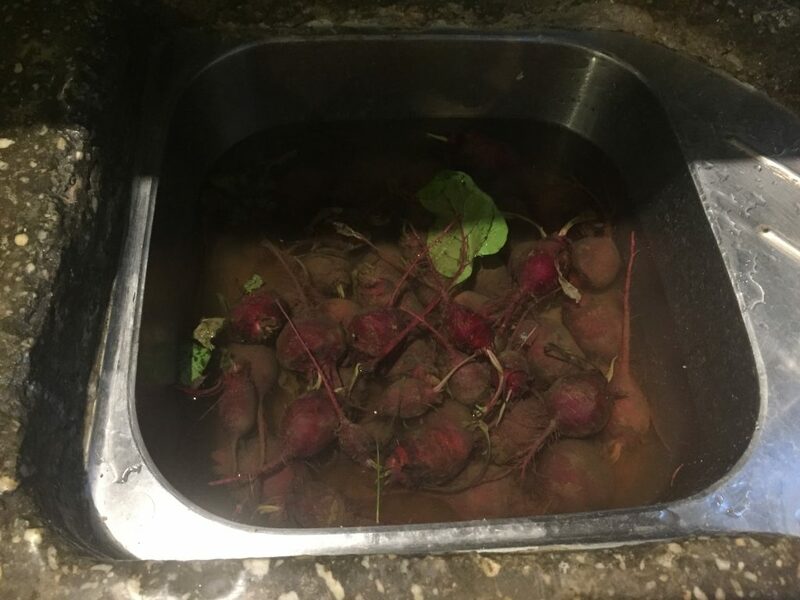 Be sure to thoroughly wash your beets. Beet greens are also another great product when growing beets. Harvesting one or two young beet leaves from beet plants early in the growing season can be a great addition to salads or as a stand alone side dish. When planting beets from seed, chances are you will be thinning the row. This is a great time to harvest beet greens too. In this case, the greens have been removed and the beets have been washed. Once washed, beets can be prepared a number of ways. Preparing beets for slicing is as simple as cutting the tops from the beets. Don’t cut too much as the entire beet is edible. You can also remove the root flush with the beet. Pickling and eating the roots is an option. Quickly roasting the removed roots is another great side dish during the beet harvest. 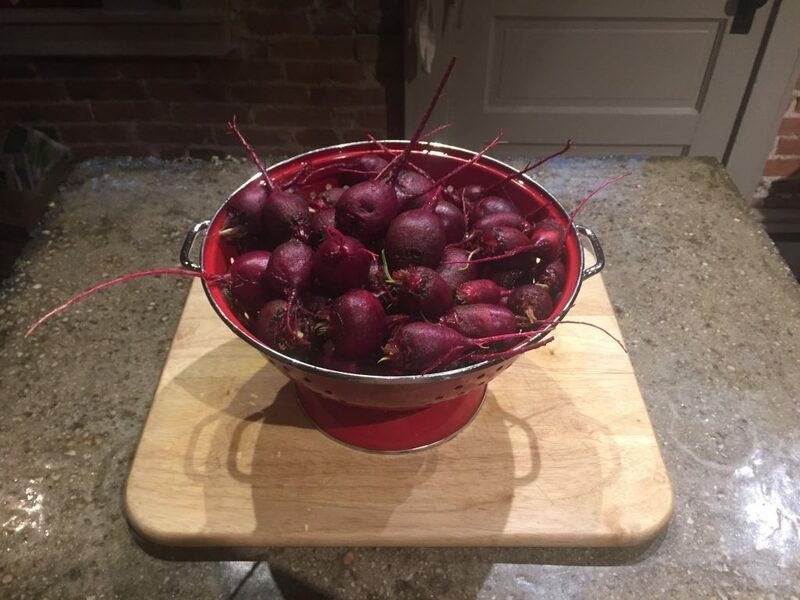 Unless first roasting or boiling the beets, trim the tops and roots from the beets. Using a mandolin is the fastest and most efficient way to get sliced beets. Thin sliced beets are the primary ingredient in both beet chips and refrigerator pickled beets. Thin sliced beets are easy to make with a mandolin slicer. 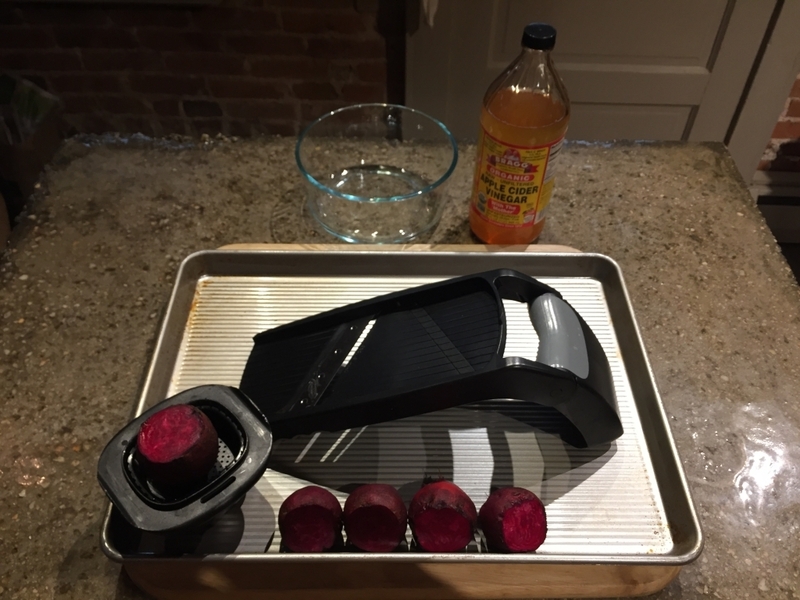 Here you can see 1 pound of whole beets sliced with the mandolin, ready for the dried beet chips and pickled beets recipes. Depending upon the beet variety, they may be entirely red or they may have a unique pattern inside. 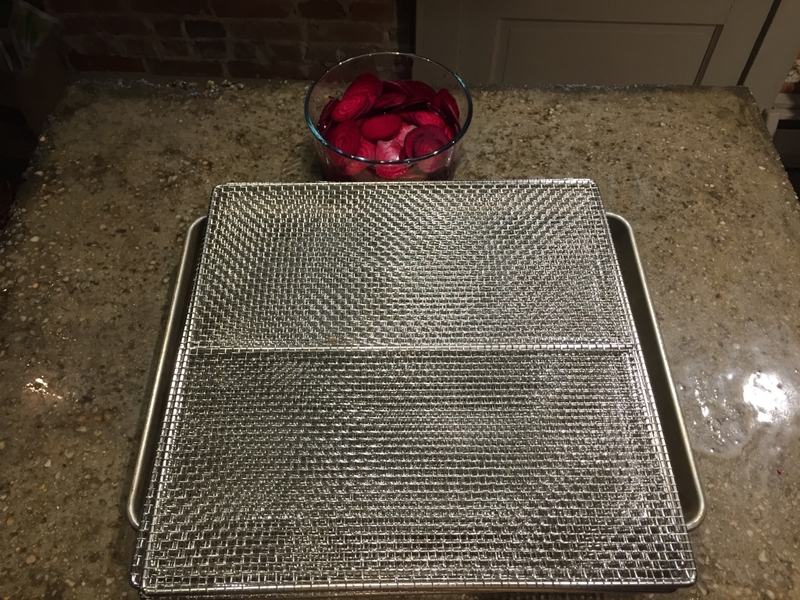 When making dried beet chips, you can soak your beet chips in vinegar prior to placing them on the dehydrator tray for some added flavor. You can also choose to have naked dried beets, adding nothing to them. Beets are messy business, whether harvesting beets or slicing them. Beet juice will stain your fingers, clothes, and wooden cutting boards. Place your dehydrator racks atop a baking sheet for easy cleanup. Beet chips will shrink dramatically when they dehydrate. Place them side by side on the dehydrator, as close together as possible without overlapping to preserve space. Sliced beets are beautiful and delicious. 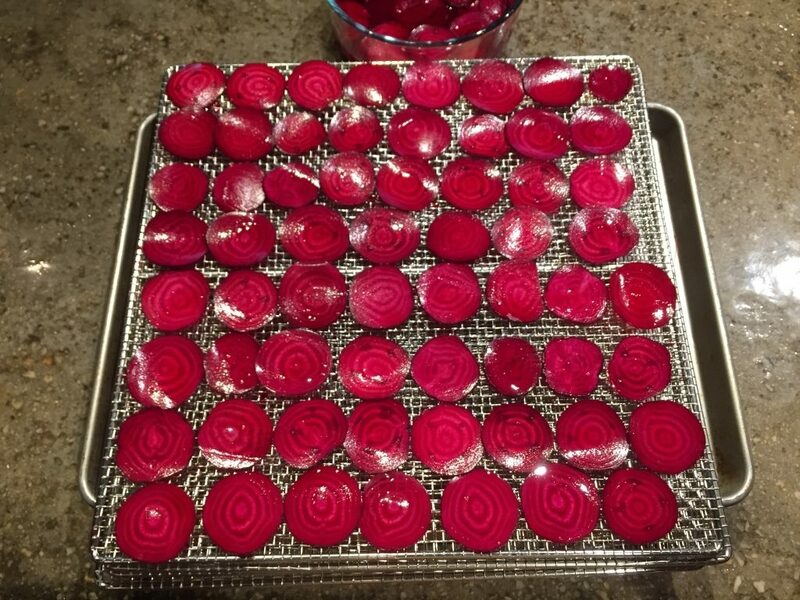 Dehydrate beets to preserve them and create delicious healthy chips. Add the trays to the dehydrator and dehydrate the beet chips at 120 degrees for 18-24 hours. That seems long, but it take a while to fully dehydrate beets and make them a healthy chip. Another great recipe for these thin sliced beets is pickled beets. In this case, the recipe is for refrigerator pickled beets. Pickled beets are a great way to prepare your sliced beets. The other main ingredient of pickled beets is pickling brine. The second ingredient for the pickled beets is the pickling brine. 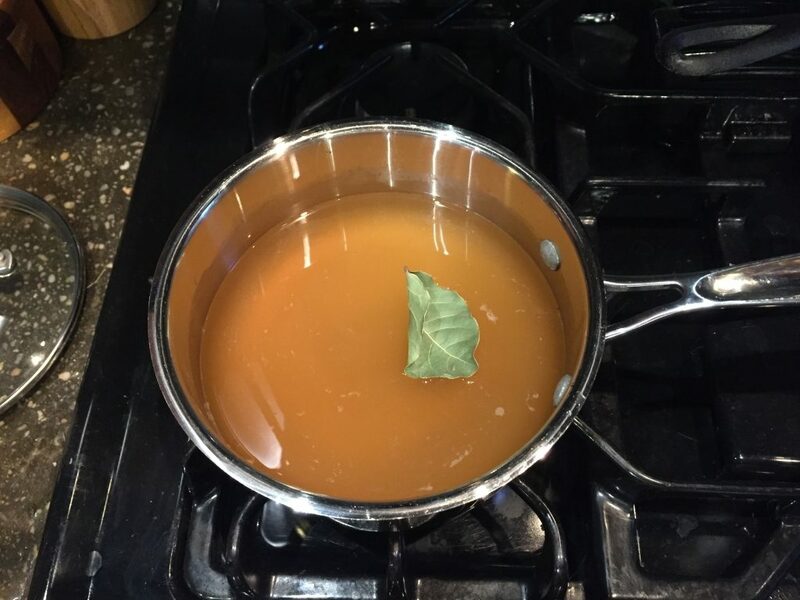 You simply add vinegar, water, sugar, salt, and spices to a sauce pan and simmer it until the sugar dissolves. Sliced beets in a jar to create refrigerator pickled beets. 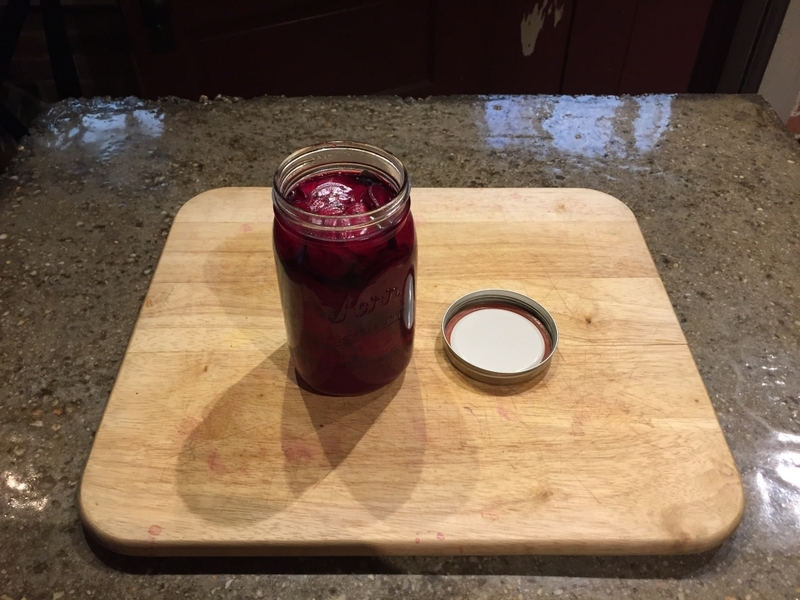 Once the brine is ready, add the sliced beets to a jar and pour over the brine. Allow the beets to cool before sealing them. Add the jar to the refrigerator for about 1 week. 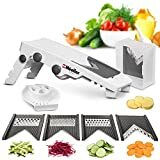 This is the only mandoline on the market with Mueller’s patented dual knob fully adjustable mechanism. Others offer just a few preset measurements and our quality is absolutely unmatched at this price point and beyond. Nothing better than cooking beets in a little water with the skin on, then peeling after cooked. Butter melted over these cut up beets makes for beet goodness in it’s purest form! I planted my seeds late and not ready for harvest, but these dried beet chips look like something I may try. Bought a dehydrator last fall! Beet chips are a great way to use garden fresh beets.